Treat your favorite golfing dad or fan of the sport to a Hole-in-One Golf Cake! 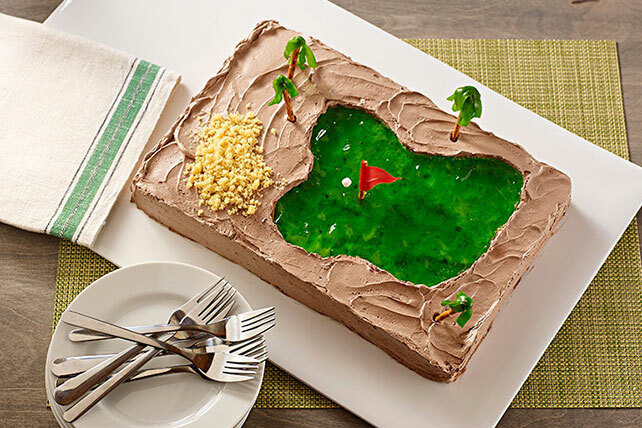 Celebrate a big win or a birthday with our Hole-in-One Golf Cake. Prepare cake batter and bake in 13x9-inch pan as directed on package. Cool completely. Invert cake onto platter; remove pan. Use small sharp knife to cut and scoop out a shallow free-form shape from center of cake to resemble a golf green. Reserve removed cake for later use. Add boiling water to gelatin mix in medium bowl; stir 2 min. until completely dissolved. Stir in cold water. Refrigerate 1 hour or until slightly thickened; pour into hole in cake. Refrigerate 3 hours or until gelatin is firm. Melt chocolate as directed on package; cool. Mix with COOL WHIP until blended; use to frost borders and sides of cake. Use small sharp knife to cut small triangle from red fruit snack roll; attach to pretzel stick to resemble golf flag. Cut green fruit roll into strips; attach to remaining pretzel sticks to resemble trees. Stick pretzels in cake. Crumble some of the removed cake; sprinkle over cake to resemble a sand trap. Roll 1 marshmallow quarter into ball; place near flag for the golf ball. Discard remaining marshmallow pieces, or reserve for snacking or another use. For a quick-set gelatin, substitute 2 cups ice cubes for the cold water. Dissolve gelatin mix in boiling water as directed, then add the ice; stir 3 to 5 min. or until gelatin begins to thicken. Remove any unmelted ice. Pour thickened gelatin into center of cake; continue as directed. Prepare using 1 pkg. (0.3 oz.) JELL-O Lime Flavor Sugar Free Gelatin and COOL WHIP LITE Whipped Topping. Prepare using a white cake mix.